Homecoming is a sign that fall has officially arrived. Bloomington-Normal is fortunate enough to be home to not one, but two universities: Illinois State University and Illinois Wesleyan University. Double the universities means double the homecoming fun! This year, IWU is celebrating 100 years of homecoming. Things will kick off on October 5, with events going on throughout the day. At Tucci Stadium, the 68th Annual Titan Games and Titanium Pep Rally will include the sorority scramble, chariot races and rope pull. If you feel like getting spooky, join paranormal investigators Eric Vogel and Lynzi Reece on a ghost hunt of two of IWU’s historical academic buildings. At the Hansen Student Center, magician Farrell Dillon will cast his spell. On Saturday, rise and shine for the pancake breakfast on the Eckley quad. Before the big game, head to the Shirk Center parking lot for the Titan tailgate. Kickoff begins at 1 pm at Tucci Stadium as the Titans play Carthage College. For a full list of homecoming events taking place at IWU, click here. On October 12, the student royalty crowning will be held at Redbird Arena, followed by Hoopfest, which will showcase the men and women’s basketball teams. 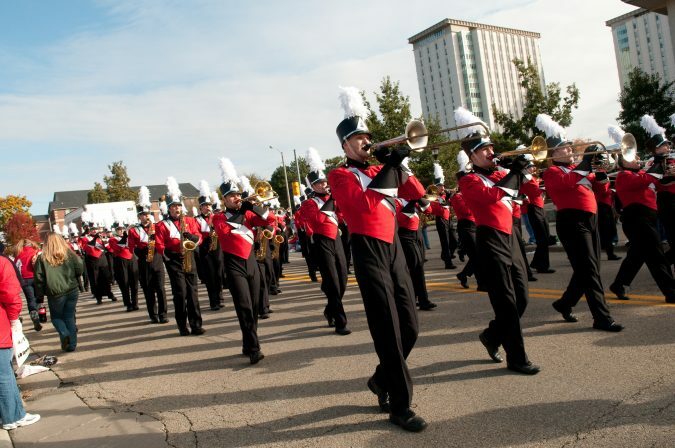 Illinois State’s School of Music will showcase the current students of the Wind Symphony and Big Red Marching Machine in a concert at Band-A-Rama at Braden Auditorium. The homecoming parade will step off the corner of University Street and College Avenue on Saturday at 10 am. Get ready for Illinois State football by heading to the Redbird Tent Zone for the ultimate tailgate. The Redbirds take on Southern Illinois at Hancock Stadium at 2 p.m.
For a full list of homecoming events taking place at ISU, click here.